For where your treasure is, there your heart will be. STEWARDSHIP OF TREASURE. JESUS, I’M YOURS. PLEASE USE MY FINANCIAL GIFTS THAT I MIGHT BRING “ONE MORE” TO YOU. As Christian stewards, we are called to prayerfully consider the gifts we have received from God, making a decision of what to give, in advance from the “first fruits” instead of what is left over after obligations have been met. To the One who has given us everything, let us return to Him the first 10% of our income as a form of worship. 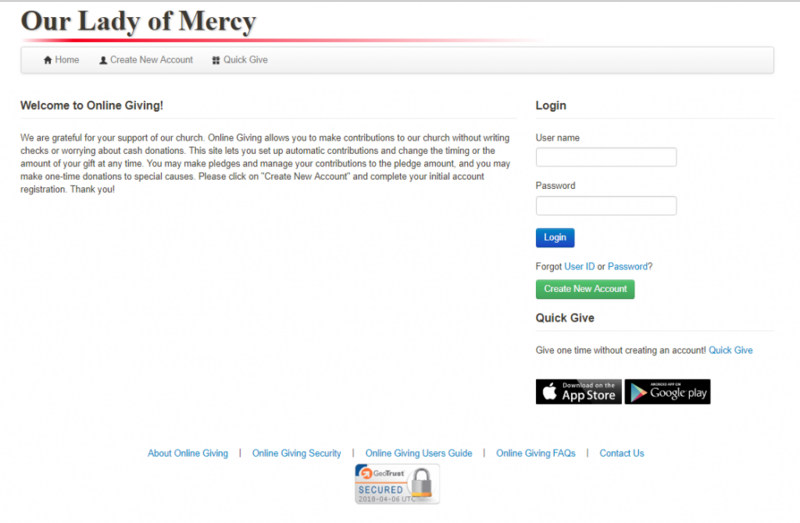 Our online giving portal is offered for those wishing to have the convenience of supporting God’s ministry in their own parish and around the world. The site is secure and allows you to support God’s work from anywhere you have an internet connection. Need help setting up your online giving account? Click here! Amazon donates 0.5% of the price of eligible AmazonSmile purchases to charitable organizations. AmazonSmile is the same Amazon you know and love-same products, same prices, same service. There is no change to your user ID, password, wish lists, registries, or Amazon Prime benefits. Every time you shop on Amazon, please type the following web link in your browser from your computer or mobile device: smile.amazon.com then select Our Lady of Mercy Aurora, IL as your charitable organization of choice. Please update your bookmark or favorites to use this link every time for every purchase. Only purchases made through smile.amazon.com credit our account, not the main website or the app. The walkway to the main door at Our Lady of Mercy contains many memorial paving stones, but there is room for many more. Engraved pavers are available for $200 by contacting the Parish Office or by filling out the form below.